Jimmy Christeas is the cobbler of Quinpool Road, working seven days a week to keep Halifax on its feet, with no end in sight. Nestled between two restaurants, shoebox-sized Quinpool Shoe Repair looks today as it has for 59 years. Two windows take up the entire storefront, but you can't get a clear view of the inside. The glass is crowded with stickers: A black jaguar with red eyes and thick yellow letters spelling out the shop's name and number. Quinpool Road is home to fast-food joints, tattoo parlours, the Oxford theatre, flower shops, construction zones and cafes. Yet, the liveliest place on this main street may be a shoe repair shop. Dimitri Christeas—everyone calls him Jimmy—a 48-year-old Greek-Canadian, works seven days a week to keep his shop alive. It's one of the last independent shoe repair stores in Halifax. When you open the door to Quinpool Shoe Repair, you'll notice the smell. For nearly six decades, three intoxicating aromas have filled this room: shoe polish, leather and glue. These smells never go away; they long ago seeped into the walls. Christeas can't smell them anymore. The pungent fumes that can cause others headaches don't affect him. Paper coffee cups teeter on shelves in-between screwdrivers, hammers, scissors and leather scraps. Shoes are scattered on the floor. Men and women stand waiting for service, making small talk about the weather and about the store. Maybe it's the music—ballads from Frank Sinatra and Dean Martin—its close quarters or its old-world charm, but they all wait, unexpectedly patient. The front room is small, no bigger than an airport elevator. It's a room in which four people can stand comfortably, but seven or eight will squeeze in, elbow to elbow. Four chairs are lined up against the left wall. Two people are sitting there, but the other two chairs are filled with bundles of shoes, each pair wrapped in an elastic band, tagged and ready to be fixed. The other wall is lined floor-to-ceiling with five wooden shelves. Since 1958, these shelves have been stacked full with shoes and now each row sags slightly in the middle. Look closely and you will notice a thick layer of dust coating the windowsill, the cash register and the key rack. The place looks like it hasn't been cleaned in decades. Everyone waits for Christeas while he rummages around looking for a newly repaired shoe—it might take a few minutes. Then he will have to find another. And another. In the midst of all this dust, leather and chaos, there have been some close calls over the years, but the store's record remains perfect: No shoe has ever gone missing. For a Wednesday afternoon, the shop is unusually quiet. Susan Malay is the only customer. When she walks in, her eyes gloss over 300 pairs of shoes, more than she had expected. She had never been here before, but nor had the zipper ever broken on her $250 brown leather boots. Malay read some reviews of the shop online. Go to a review page and you might read: "They don't make places like these anymore." "So happy with the results and the fella who runs the place is a total delight." "He winterized a few pairs of my heels by adding rubber lifts and rubber to the soles and I no longer fall down when drinking!" Christeas takes her boots to the back. Most cobblers wear an apron while they work, but Christeas finds it confining, like an unnecessary seatbelt. And he doesn't need one: His clothes are immaculate. He wears the same black running shoes, a pair of slacks and a clean, soft pullover sweater nearly every day. For a man who works 80 hours a week grinding, cutting, sewing, hammering and polishing shoes, the only real evidence is in his hands. His nails are jagged, but he will use the sanding machine to make them smooth. Black shoe polish seeps into the cracks on his fingertips and stains his palms. This week, there's a gash on the knuckle of his left thumb, covered up in masking tape—he hates Band-Aids. Christeas fixes Malay's shoe zipper in less than 10 minutes. He has been fixing shoes since he was a teenager. "Take it and try it," he says, handing the boots back to her. "There's no charge." Christeas does his work with confidence. He gets excited watching customers react to the final product. Sometimes, he pictures himself as Superman. "We put the magic dust on it," he says. He watches her zip up the boots as he leans on the shelf, eating his lunch. Malay tries the boots on and walks a couple steps before running into a pile of shoes. The zipper stays shut. She is satisfied. As she opens the door, boots now in hand, she turns her head and calls back to Christeas, "thank you, I'll be back!" Malay is one of the hundreds of happy customers Christeas relies on for business. Some travel hours across the province and return year after year, all in the name of shoes. Christeas was born in Halifax, and lives with his parents a short drive from the shop. He was 12 when he fixed his first shoe, a woman's high heel. Growing up he spent lunch hours and late afternoons with his dad at Bayers Road Shoe Repair. It was not much bigger than the store Christeas owns now. Three years later, in grade nine, Christeas was pulled from school to work full-time. Instead of going to school during the day, he worked at the store; his dad needed the help. He would try to finish high school by taking night classes. As a teenager, Christeas was not passionate about being a cobbler—he liked airplanes. But he cared less for school and preferred working. In the 11th grade, Christeas dropped out. His dad supported this decision. 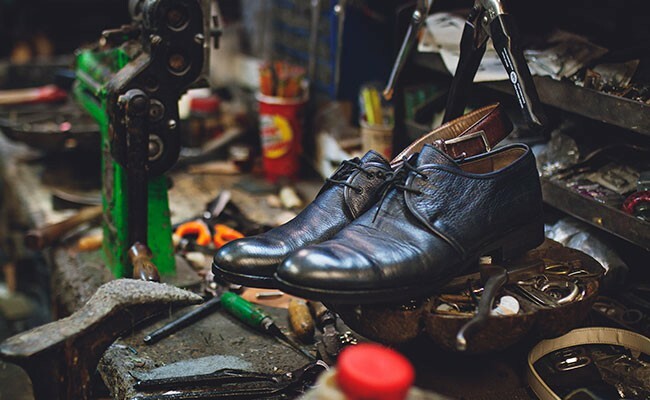 Working with Dad was natural—making and mending shoes had been in the family for generations. Dad grew up in Sparta, Greece, where at 16 he started making shoes by hand in the family shoe shop. He came to Canada in 1960. He was 25. During WWII and the Greek Civil War, more than 100,000 Greeks came to Canada in search of peace, stability and employment. Of these, some 250 families came to call Halifax home. By 2011, Halifax had nearly 3,000 Greek immigrants. The majority of Greek immigrants could not speak English and did not have high school or university degrees. The newcomers set up their own businesses: Restaurants, shoe repairs stores, bakeries and tailor shops. These skills were oftentimes passed down through generations of Greek families. Like Christeas, who learned the craft of caring for shoes from his father, who learned the craft from his father in Greece. At age 82, Dad will still appear at Quinpool Shoe Repair to work, but only when he wants. Christeas took over the store over 10 years ago when his dad retired. Dad still calls it "his." The shoe repair business in 2017 is grim. People who have been in the trade for decades are retiring and it is nearly impossible to find replacements. There is only one school in Canada that teaches shoemaking. At last count, in 2011, there were 1,460 shoe repairers and shoemakers in all of Canada, down from 2,010 in 2006. Sixty years ago, 29 shoe repair stores were scattered around Halifax and Dartmouth. Now, with twice the population, only four indies remain. Christeas runs Quinpool Shoe Repair alone. He says he's lucky to have friends and family who help, but it's not enough to change the reality of his working life. The decline in shoe repair has been accompanied—or led by—a decline in the shoes themselves. In the past 20 years, Christeas remarks that shoes have changed. Now, they're made with cheaper materials, sometimes harder to fix. When he grew up, everything was made with quality leather. This is not a trend limited to footwear. The consumer world in clothes, appliances and electronics is geared towards disposal, not repair. 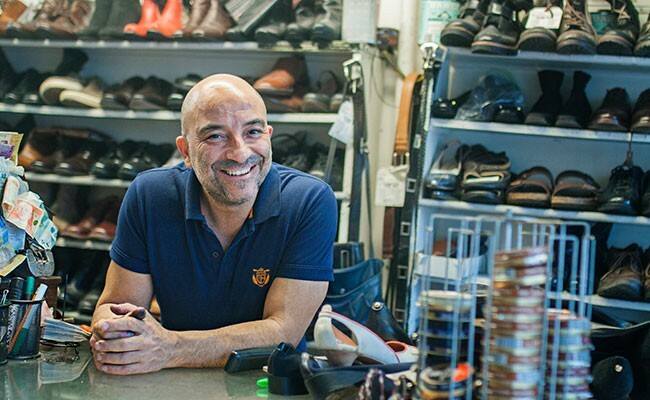 Christeas is part of the solution—a huge part given the small number of cobblers in the city, and Quinpool Shoe Repair is busier than ever. But Christeas will never turn people away. In fact, he'll charm you enough to keep you coming back. Blissfully unaware of his natural charm, Christeas makes every woman feel like she is the prettiest in the room and men feel like they are brothers. When you first meet him, it might feel like you have known him for years. He stands close to look at your shoes, leans in to talk and when he smiles he looks you in the eye. If you get a hug from him—highly likely—his strong cologne will linger on you. Every day Christeas is interrupted at work by friends or family to talk politics, weather or personal affairs. He has regular visitors: Jalal Hosein, his doctor, comes every Saturday; his closest friend Paul Troup, also Greek, works down the road at the liquor store; Antonio Feijoo, a Metro Transit supervisor from Spain—all of whom stop by just to say hello. Christeas enjoys these visits. But one regular doesn't just come in to say hello. Paul Ransome has spent every afternoon at Quinpool Shoe Repair for eight years. It's past noon and the door opens. Ransome saunters in with a McDonald's coffee. He wears a black leather coat with a matching leather cap. Ransome is 69, deaf in one ear and blind in one eye. He takes his seat in an empty chair—there's always a chair for Ransome. "It's Pauly-wally," Christeas will call out jokingly. Ransome puts his coffee down on the little brown side table and picks up the paper. He brings it close to his face so his good eye can read the fine print. Ransome met the Christeas family 30 years ago when they owned Bayers Road Shoe Repair. He would occasionally visit the store with his mother. Since her passing, Ransome has found comfort and companionship at Quinpool Shoe Repair. Ransome says coming to the store is better than sitting around his house all day. Sometimes he'll doze off. In winter, he'll shovel the snow off the front steps or salt the sidewalk. At lunch, Christeas buys him chili and a roll. If he gets bored he might mosey to the back and watch Christeas work. If he mumbles about deals at Walmart or the most recent car accident in Halifax, Christeas will always listen. At the end of the day, Ransome is still in his chair. Without turning off the music, Christeas dims the lights and ushers Ransome to his car. Christeas will drive him home or to Walmart, without hesitation. Ransome is family. One evening after 7pm, Kosta Perry is in his bedroom at his mother's place. He's sitting in front of his desktop computer, working on homework. Perry, 24, is Christeas' only child. Perry wants to be an engineer, not a cobbler. His iPhone lights up on his desk, next to him. Dad is calling. He picks up the phone and they exchange pleasantries. "Hey, how are you?" his dad always asks. "Do you need anything? Are you well?" Perry asks his dad about buying a machine to filter the air inside the store—there isn't one. The fumes, Perry says, are the worst they've ever been. This is a typical conversation. Perry doesn't always see Christeas as a dad, but more of a brother. They talk about business, politics and personal matters with ease. Christeas and Perry's mother separated when Perry was six years old. He grew up with his mother. When Perry was 13, he spent seven weeks in Greece with his dad, the longest they'd ever been together. They have continued this tradition ever since, living in Greece, every summer. Quinpool Shoe Repair is closed during this time. They both say it's their favourite time of the year. Mirroring his father's childhood, Perry grew up in the shoe store. At the time, Christeas was the owner of West End Mall Shoe Repair, which he had for four years. While his father worked, Perry would play with leather and tools. Christeas tried to share the work with his son, but he quickly realized Perry had no intention of taking up the trade. Perry lost interest during high school, calling the job "outdated." Perry is enrolled at Dalhousie University where he studies engineering. He helps at Quinpool Shoe Repair two or three hours a week if his father needs extra hands, but his heart is set elsewhere. If school goes well, he wants to move to Toronto. Christeas is happy for his son, but wants him to stay in Halifax. Perry predicts he will not take over Quinpool Shoe Repair. In his softer moments, this realization makes him feel bad, but he is determined not to live his life in guilt. Back on the phone, Christeas and Perry talk for around 15 minutes about new machines. It ends and they say goodnight. They'll talk tomorrow. If you listened in, you would have a hard time deciphering who is who. Perry long ago picked up his father's manner of speech. Perry is concerned about the future of his father's business. He wonders who will do the work and how long his father will last. But this isn't something he and his dad talk about. It's 2:30 on a Saturday afternoon, the busiest day of the week. Martini in the Morning is playing, an online radio station serenading the store with a mixture of America's greatest hits: Billie Holiday, Barbra Streisand, Ella Fitzgerald. There are six customers in the shop. For lunch, there's pizza from King of Donair next door. The delivery person bustles through the store, beelining to the back. He hesitates with the pizza box, unsure where to put it. Everything is covered with shoes, tools and coffee cups. It feels like a circus. Christeas takes the pizza box. The delivery person turns around, wiggling through the customers. "See ya later guys, good luck!" He raises his hands, signaling a wave. Within seconds he's out the door. Christeas' younger sister Tia Caines is standing behind the glass counter. Caines is petite, with manicured eyebrows, clear olive skin and dark hair. She keeps her hands protected from the polish residue and dusty surfaces with clear plastic gloves. Caines spent her childhood in her father's shop too, but she went to university instead of taking over the business. Caines is a pharmacist and works at Quinpool Shoe Repair when she can. When a customer walks in, Caines doesn't spend time with small talk—she treats everyone as customers, not friends. Caines wishes the place were more organized and clean. She thinks Christeas works too much. She wants him to find someone to take over, but she knows this is unlikely. "Jim, I need your help," she'll call out, sometimes in Greek. If a customer asks for pricing she might not know the answer. And finding shoes in the organized chaos can be difficult, especially if Christeas hasn't had time to place them on the shelf. Christeas has a system, but he's the only one who knows where things are. Grabbing the shoes' identification tag from the customer, he'll read the numbers and spin around to face the shelves. His fingers wiggle in circles, hovering over the shoes as he thinks. His eyebrows furrow. His jaw sticks out. He jumps on the shelves reaching for shoes in the back. If he can't find what he's looking for, he'll ask the customer: black or brown? Boots or shoes? What did they need fixed? They'll respond and almost immediately a light bulb goes off. He'll present the restored shoes to the customer like they are a work of art. He's proud of his work. The customer is pleasantly surprised. Christeas says "they can't believe how good the shoes look after it's done." He says the shoes often look better than new. He opens the 59-year-old cash register, an original to the store. He takes cash or cheque—no debit. He calls out while the customer walks out, "If there are any problems, bring them back, we'll fix them—no charge." He likes to reassure the customers that no matter what, their shoes will be fixed. Christeas says that when people leave the store they "always leave with a smile." It's 6pm on the dot. Christeas walks over to the door and turns the lock—one of many satisfying parts of his day. He shuts off the lights in the front room and goes to his computer in the back. Its outer layer is coated in two years worth of dust. From YouTube, he turns on the theme song from Superman. Like a young boy, Christeas loves superheroes. More than anything he wants to fly, to save the damsel in distress—just like Superman. He gets back to work. For 30 minutes a playlist with songs from Batman, Spider-Man and Indiana Jones movies blasts through the speakers, drowning out the roar of the sanding machine. Christeas stays after hours at Quinpool Shoe Repair every night—he has to, he says, to keep on top of the workload. The store is closed Sundays, but he comes in and works during the afternoon to catch up. Christeas powers through the shoes lined up for him on the floor: Spray, shine, repeat. Christeas may not be Superman, but he loves to add this special touch, the final sprinkle of magic dust. Erin McIntosh is a freelance journalist who hates the smell of shoe polish and leather.